According to an October 30, 2014 article by P.J. D'Annunzio in The Legal Intelligencer entitled "Pa. Justices Deny Appeal in Juror Bias Med Mal Case," the Pennsylvania Supreme Court has issued an Order declining to entertain the appeal from the 6-2 en banc Superior Court decision in the case of Cordes v. Associates of Internal Medicine overturning a defense verdict in a medical malpractice case after finding that the plaintiff's case had been prejudiced because three of the jurors allowed to serve on the panel at trial had ties to the defendants. Justice Correale Stevens did not participate in the Court's per curiam Order denying allocatur on the questions presented pertaining to a party's right to a fair and impartial jury at trial. 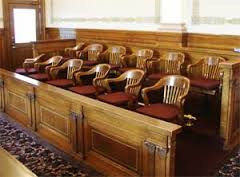 Click HERE to go to the previous Tort Talk blog post summarizing the Superior Court's decision. There are links to the Superior Court's Opinions in Cordes in that blog post if you are interested in reviewing the same.